With its many clubs and watering holes, Clarke Quay has long been synonymous with nightlife. And with the upcoming launch of iconic nightclub Zouk — which is relocating from its Jiak Kim premises — this reputation will certainly continue to prevail. But if the past year is anything to go by, Clarke Quay is also shaping up to become a foodie haunt. The last few months have seen a slew of restaurants setting up shop in the area, from Modern Indian eatery Maziga to lobster ramen joint Ramen Keisuke Lobster King and all day dining spot Privé Clarke Quay. The newest entrant to the scene is VLV Restaurant, a Chinese fine dining establishment. It is part of VLV, a multi-concept space that comprises a swanky club lounge, alfresco courtyard bar and riverfront dining area. 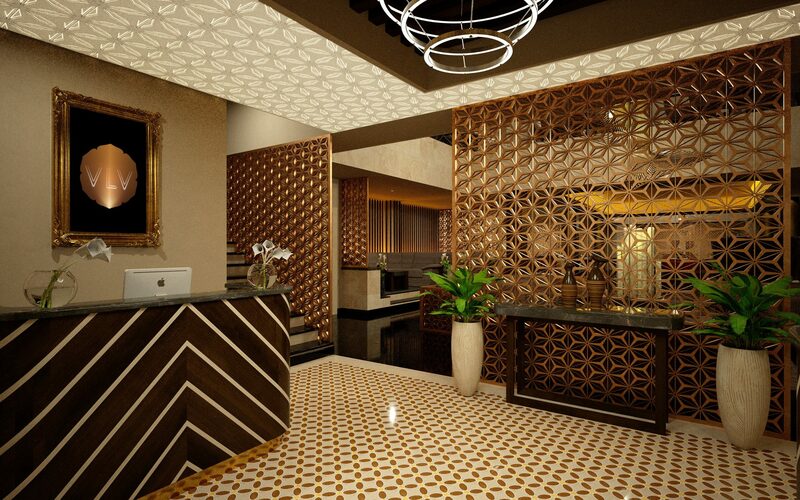 VLV Restaurant’s interiors are opulently decorated. VLV is set in the iconic River House, which is the oldest building in Clarke Quay and is one of two surviving traditional Chinese mansions in Singapore. The heritage building was first constructed in the 1880s and was home to a Teochew merchant, before being turned into a warehouse years later. VLV Restaurant is located on the second floor of the 20,000 sq-ft venue, and is an elegantly space clad in soothing neutral hues with cushy booth seats, lattice ceiling panels, and artworks lining a wall. It is an airy, relaxing place during the afternoon, with abundant sunlight streaming in through the windows and, at night, transforms into a swish spot with fancy golden lights. 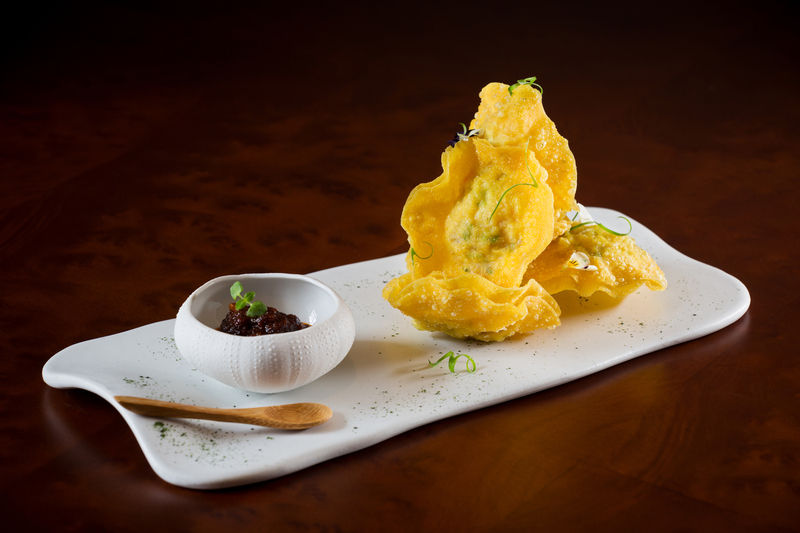 This appetiser of crispy lobster wontons was oh-so-satisfying. The restaurant focuses on contemporary Cantonese food, but its extensive repertoire of over 60 dishes features flavours from Sichuan, Japanese, Korean and Western cuisines. Some of its creations also incorporate unconventional ingredients such as caviar, kimchi and black truffle. VLV Restaurant’s kitchen is headed by Executive Chef Martin Foo, whose previous stints include working for the Tung Lok Group and Lei Garden Group. For an appetiser, we started off with Foo’s lobster wontons (S$16), which came in a set of four crispy dumplings stuffed with water chestnut, shiitake mushroom, bits of cilantro and succulent chunks of the crustacean. Tasty and satisfyingly crunchy, the wontons were best enjoyed with their accompanying homemade sambal sauce — a piquant and delectable blend of chilli and dried shrimp. 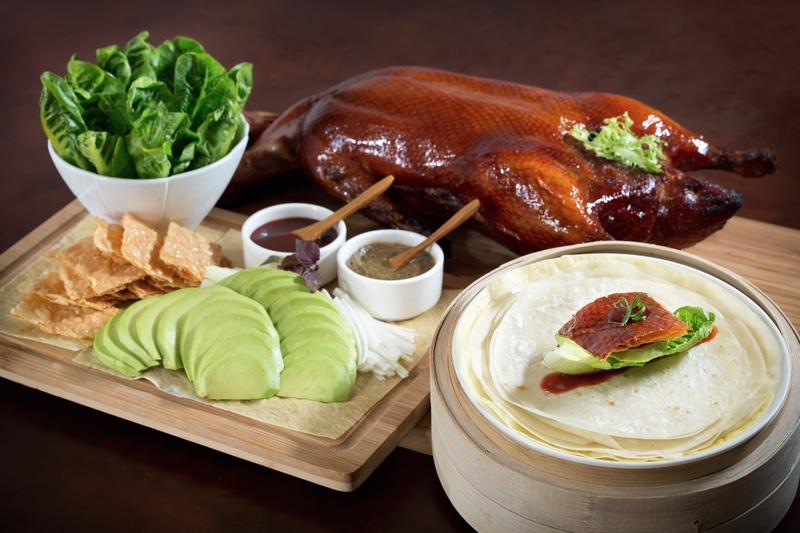 Savour Peking duck with avocado slices, crunchy beancurd skins and truffle foie gras sauce. Next up was the restaurant’s signature Peking duck (S$55 for a half duck and S$110 whole), featuring a roasted 45-day-old duckling. The duck’s skin was delightfully thin and crispy, and came served with a variety of unusual condiments such as avocado slices, fried beancurd skins and truffle foie gras paste. The latter paired surprisingly well with the homemade hoisin sauce in a juxtaposition of savoury and sweet, and was also delicious when simply eaten with the duck skin. We also liked the inclusion of the beancurd skins, which added crunch and textural contrast. Double-boiled soups have always been integral to Cantonese cuisine, so we just had to order a bowl at VLV Restaurant. 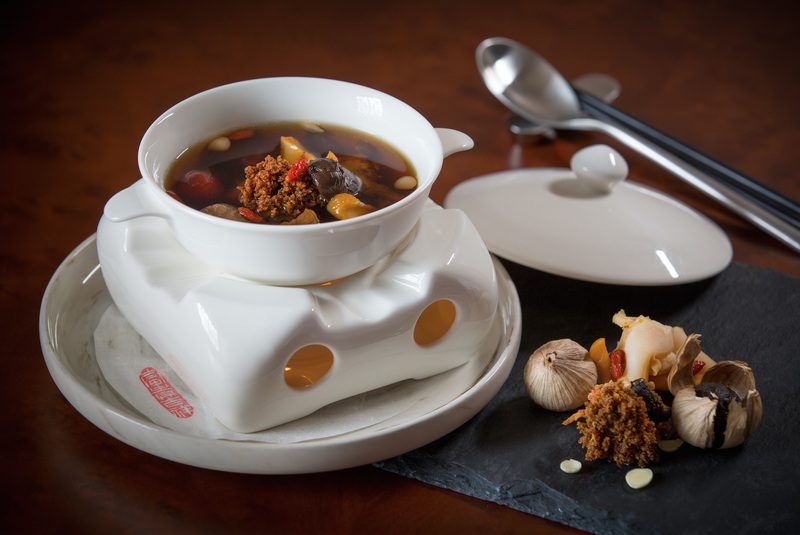 We tried the black garlic and sea whelk soup (S$18), a warm and comforting chicken-based broth sweetened with the natural flavours of black garlic and goji berries, and punctuated with sea cucumber flower, dried scallops and chewy chunks of whelk. This black garlic and sea whelk soup was nourishing and tasty. Another stellar dish was the Beggar Chicken (S$58), which was encased in a mud shell set alight at the table. 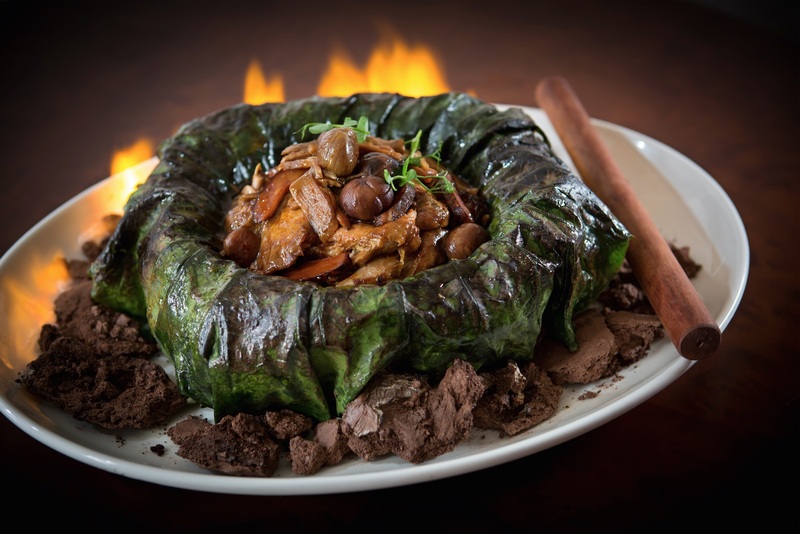 To amp up its already dramatic presentation, we were given a stick to smash apart the flaming shell, revealing the lotus leaf-wrapped meat inside. Baked in an oven for over five hours, the chicken was tender and juicy. It was tossed with chestnuts and bamboo shoots, and for a final indulgent finishing touch, drizzled with aged Hua Diao wine. Accompanying it was a side of “rock rice”, which consisted of chewy, glutinous rice-like grains sourced from the mountains of Nepal. The rice had no taste, but provided an interesting textural contrast to the smooth chunks of chicken. This chicken is literally on fire. Rounding off our meal, we polished off a bowl of Orh Nee (S$12), a traditional Teochew yam paste dessert. The restaurant’s rendition was refreshing and creamy, and stayed pretty close to the original recipe other than its addition of coconut ice cream. 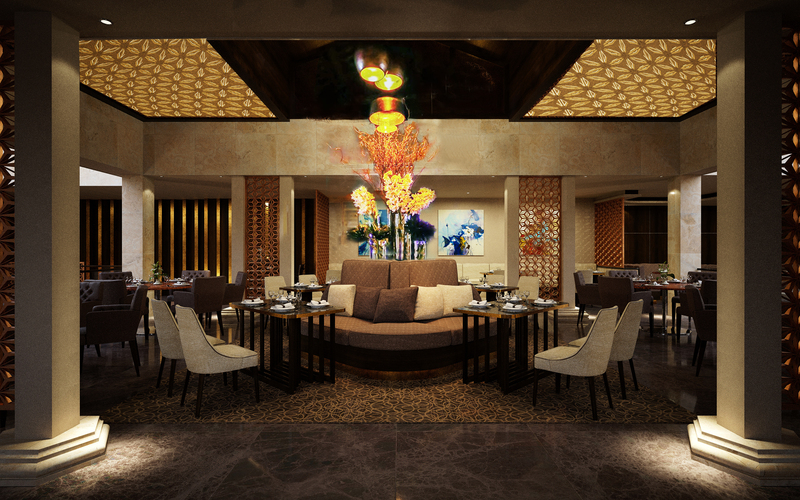 VLV Restaurant is off to a promising start with its solid repertoire of Cantonese cuisine and trendy locale. In fact, we can already imagine that it’ll be popular among partygoers looking to fill up on substantial fare before heading off to the clubs. It also helps that the first floor of VLV is occupied by a posh lounge decked out in leather seats, plush sofas and a dance floor — so patrons can boogie the night away right after their meal, without even leaving the premises. Now we know exactly where to go this Friday night.